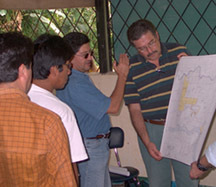 ISIS's work with the Secoya to protect their lands from damaging oil development has two elements: legal and technical advice for the Secoya in their ongoing dialogue with Occidental Petroleum, the company licensed to explore for oil in Secoya territory, and support for community monitoring of the oil company to ensure that agreements established during the dialogue are kept and impacts to the territory minimized. Since 1998, ISIS has been advising the Secoya in their dialogue with Occidental Exploration and Petroleum Company regarding oil exploration in their territory. We led efforts for a precedent-setting Code of Conduct to protect Secoya rights in relations with Occidental. 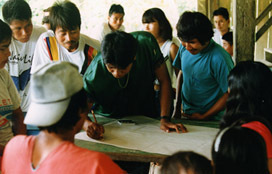 Signed in October 1999, the Code (available in English, Spanish, and Pai Coca, the Secoya language) is seen by groups ranging from environmental NGOs to government officials as a model for relations between indigenous groups and multinationals. Following that success, and after several months of negotiations held under the Code, ISIS helped the Secoya win important environmental and cultural protections as well as compensation for oil development that, for the first time, addresses long-term community needs. This compensation includes projects for infrastructure and development, an investment fund, and a small payment to each Secoya family (read the agreement in Spanish). The negotiations also established an innovative community-based monitoring program that, with technical support from ISIS, watches over oil activities in Secoya territory. To date, the company has built two platforms and drilled two wells in Secoya territory and has done some seismic testing. They have permission to drill two more wells and do additional seismic testing. There are disagreements, however, ranging from the definition of the area in which they are allowed to work to the results of the reforestation of the abandoned wells. ISIS continues to provide legal and technical support in negotiations and to support community analysis of company proposals and of documents such as environmental impact statements. For further reading, we have collected a handful of articles about the dialogue process to help tell more of the story, from a variety of perspectives. Although the Code of Conduct and subsequent negotiations won important rights for the Secoya in their dealings with Occidental, industry and government policies at the national level haven't changed. Throughout the Ecuadorian Amazon, oil companies continue to offer trinkets and to use threats to win entry into areas where they want to work; agreements reached with communities represent ad hoc responses to local situations rather than a nationwide application of constitutional rights. ISIS is preparing an analysis of the varied agreements made by Occidental, the consortium building the heavy crude pipeline, and other oil companies with indigenous communities and local governments. This information will be available to communities facing oil development, as part of our Center for Information and Training. It will also contribute to calls for a national policy for consultation and participation in oil development. ISIS is working with a broad NGO and civil society network in Ecuador and internationally to anticipate and mitigate the environmental threat posed by construction of a new heavy crude oil pipeline and to respond to the newest round of oil concessions in southeast Ecuador. The fact that Occidental is one of the members of the consortium building the pipeline makes it particularly appropriate that ISIS be involved. We have been pleased to find that our diverse team with their many contacts have been able to contribute important information both to international education campaigns and to grass roots communities affected by the oil pipeline. As oil development pushes into new areas of the Amazon, we look forward to providing legal and technical support for communities claiming the right to say no to the destruction of their forest. These Amazon Projects pages are historical. For current information, please visit laslianas.org. Photo credits for `Responses to Oil' pages: Jim Oldham.